Animals are opportunists. They take good shelter and nesting sites wherever they find them. In the city, where development destroyed their natural places, animals are forced to be extra-inventive. For us, it means they sometimes are a bit too inventive and we must take back space we can’t share. Animals usually enter by accident, rather than by design. Either way, here’s how to return them to the wild. If you must handle a wild animal always wear heavy gloves. They’ll protect you from bites, parasites and diseases. Even small animals like rabbits and squirrels can deliver a deep bite. Gloves also keep your scent off the animal. If you must evict a wild “tenant” for some reason, here are some ideas. First confirm that you really do have an animal in residence. To do this sprinkle flour on the ground outside the opening(s) and look for footprints in the morning. (The footprints can also tell you just what kind of animal is there. Many web sites, such as this one, offer detailed descriptions.) Or you can loosely pack a wad of rags or newspaper into the openings and see if they’re dislodged the next morning. It’s crucial not to evict an adult who’s tending to her young. In most cases it’s only a matter of days or a few weeks before she and her babies will leave the nest. Wild animals move around and don’t stay in the same nest for prolonged periods. Flour sprinklings will tell you when all activity has ceased outside the entry. One way you can check for activity inside the hole is to place food inside, then close off the hole with a screen (for airflow). Check the next day to see if food has been eaten. If it has, unseal the opening. Only when you’re certain the cavity is empty is it time to seal it with rocks, boards or a heavy screen. Be sure to install the barrier from the top of the entrance down several inches into the soil. Once again, be sure all the critters are evicted: Trapped animals will die and the smell of their decomposing bodies will present another, possibly worse, problem for you. If you can’t wait, see if a certified wildlife rehabilitator will help you trap mother and babies and move them altogether to another location. As a last resort, you can call Animal Control, but be aware that they will probably destroy the animals. If you see any animal pacing and digging at an area you have sealed, open it back up immediately. Babies have been trapped inside. Yeah, but what if the mother is a skunk? Skunk mothers raise their young between about May and August. Try not to evict them then, if possible. At least be very sure you leave no babies trapped inside. Skunks are actually very clean animals and they don’t spray inside their den. Still, there will be a mild “skunk” smell. This may not matter if the den is under a shed at the far corner of your yard, but if they’re living under your porch it might be a problem. Contact a qualified animal trapper to remove the skunks. He’ll ensure that mother and all the babies are caught and released together into a wild habitat. By late fall, perhaps in October, the family might move if they have outgrown their quarters. This would be an appropriate time to seal the opening. If they don’t leave then, the young, who usually spend the winter with their mother, will definitely leave her the following spring at breeding season. At this time you can seal the mother skunk out once and for all. Don’t wait past late April to do this, as the skunk will have given birth to her new litter and your waiting cycle will begin again. Skunk: Skunks are not aggressive animals and will spray only as a last resort, so rescuing a skunk isn’t as hazardous as you might think. A skunk will warn you before spraying, unless you take him by surprise. Let him know you’re there by continuously speaking softly to keep him from becoming startled. You can read about their warning signs on this page. You can help a skunk out of a shallow window well by lowering a 1-foot-wide plank into the well. Lower it very slowly and pause any time the skunk appears agitated or begins to raise his tail. Stay as hidden as possible while doing this, but continue to speak softly. Make sure the board is long enough to reach from ground-level down to the bottom of the well. Slope it as much as possible (no steeper than a 45-degree angle). This time tie a rope to each side of a deep cardboard box or a large pail, such as a small, metal trashcan. Put a strong-smelling cheese — Camembert, Roquefort, Muenster, Parmesan — at the back of the container and lower it very slowly into the well. A sudden motion will startle the skunk, as will touching it with the container (and you know what happens when a skunk is startled!) Lay the container on its side, wait for the skunk to go into it and then slowly raise it. Leave the container laying on its side on the ground. Have something handy to cover the well. The skunk will leave as soon as it has finished its cheese snack. Rabbit: Throw a blanket over it, enter the well, scoop it up in the blanket and place it in a box or bucket. Once topside, just gently pull the blanket away from it. If it doesn’t jump immediately out of the bucket, turn it on its side or even gently empty it out. Other animals: Use a board, as described under “Skunk,” above. Or place enticing food at the bottom of a deep bucket. Lower the bucket into the well and place it on its side. Soon as the animal gets in, quickly but smoothly raise the bucket and place it on its side, pointing away from you. If the animal is still finishing his snack, leave the area and retrieve the bucket later. A variant to this is to tie your end of the rope to the end of a pole. This will allow you to stay farther away from the critter in the bucket. As a general rule of thumb, try not to evict any animal from your attic between March 1 and October 1, the season when mothers are rearing their babies. After that, move adults out because of their potential to be destructive. If you hear sounds off and on in the daytime, you’re likely listening to squirrels as they come and go. Raccoons sleep during the day and you’ll hear them thumping about after about 10 p.m. and again at dawn. Never barricade an opening into your attic until you’re certain no animals have been left inside. If you do, not only will animals die, but you’ll have to contend with the odor of decomposing bodies: Nests are often tucked under the eaves, where they are easy to overlook and hard to get to. If you barricade a mother, the babies will begin to move around, looking for food. If they fall between walls, you’ll have the further complication of having to tear out drywall to get rid of the odor. The easier solution is simply to leave the family alone until the young can take care of themselves. Once weaned, juveniles and their mother often all leave at once. Once you’re certain they’re gone, seal the entry with heavy gauge wire mesh (often called hardware cloth) out to several inches past the original opening. You may have to install the barrier after nightfall, when the whole family has left in search of food. Raccoons: Place a bowl of cat kibble on the ground where the raccoon will find it after dark. 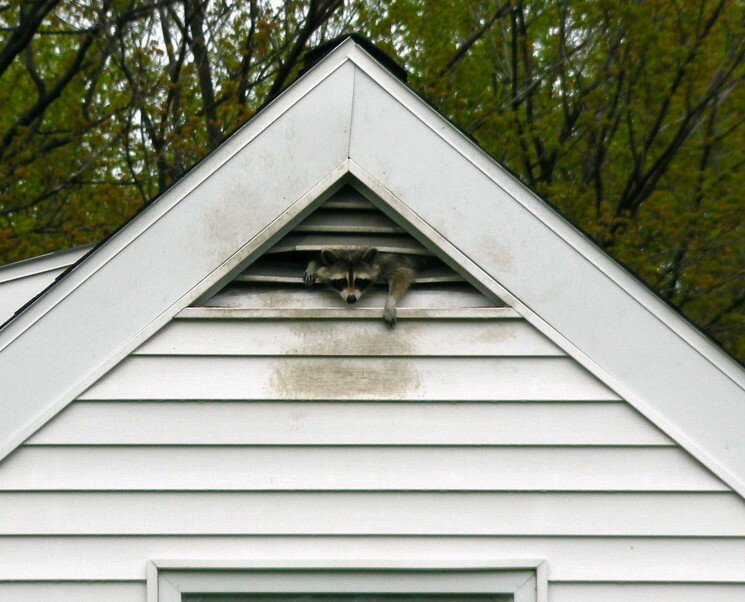 If the raccoon is a female, she undoubtedly has babies hidden away in the attic. As they get older they’ll start going outside with their mother. Count them. After a few days, when you know the mother and all the babies are accounted for outside, seal the opening. Bats: The thought of bats frightens many people, but the truth is they’ll do you no harm. Bats are non-confrontational and peaceful. The bats most likely to be living in your attic are the Big Brown or the Little Brown. They haven’t been linked to a single case of human rabies in the past 15 years. Not only that, but, in all of American history only four cases of human rabies are known to have been caused by house-dwelling bats. As with other animals, never evict bats during their maternity season, which in this case is about April 15th through August 31st. The young, called pups, cannot fly and will die. It’s only a little wait on your part and will save some lives. Also avoid evicting bats in winter, as you’ll be forcing them out during their hibernation season into temperatures they can’t tolerate, with no ready roost and no food source (insects). Late fall is the best time. The Organization for Bat Conservation says to enlist the help of several friends to each watch a different side of your house from dusk until one hour after sunset. The goal is to find the opening(s) being used by the bats. Bats are able to get in through a hole the size of a thumb, so look closely and expect them to fly out fast. You may have to do this several nights until you find their opening. Also, don’t bother to do this if the weather is cold. Bats intermittently hibernate through the winter and there are nights when they will not leave the attic. Once their opening into the attic is located, mount a bat house near it and the bats will become accustomed to it as they come and go. A week later, during the day, secure a large mesh screen on three sides around the opening(s) into your attic. The screen should extend a foot past the opening on all sides. Keep it loose enough for the bats to crawl out through the open bottom. They won’t be able to get back inside, however, and will look for the closest good place to roost. Hopefully, it will be the bat house you’ve conveniently placed nearby. There! You’ve evicted your tenants and also helped them settle into a new place. Leave the screen in place for another week and then permanently secure it. As for where to place the bat house, hang it on the side of your house or another building, under the eaves and in a spot where it will get a few hours of sun each day. Or hang it on a pole or tree, although tree-mounted houses reportedly have lower occupancy. The house needs to be 15 to 20 feet off the ground. Bat houses mounted in the spring, before birthing time, are more successful. Birds: If a bird gets trapped, leave your attic door open so as much light as possible enters from outside. The bird will go to the brightest spot. If necessary, shine a bright light just outside the attic door. If the attic door leads into your house, prepare the room it will enter by closing all doors, opening windows and dimming the lights. This will hopefully draw the bird straight from your attic and dto a window. Afterward, be sure to look for and plug the attic opening used by the bird. With the exception of mice and insects, no wild animals are likely to get inside your house. If one does, be sure to look for and repair the opening it used– an open door or window, a tear in a window screen, down the chimney, through an opening in a wall or even a roof vent. Otherwise, it might invite itself inside again. Bird: The bird will go to the brightest spot. So, close all doors to the room, dim the lights and open windows. Alternatively, open only one window and draw the drapes or blinds on all other windows. The goal is to make it darker in your room than it is outside the window(s) you want the bird to exit through. If necessary, shine a bright light just outside the window. Or, try to corner the bird and then gently cup both hands around him. It’ll be frantically flapping his wings, trying to get away. Hold its wings flattened against its body to keep it from getting hurt. Squirrel: A trapped squirrel can do a lot of damage by gnawing around windows as it tries to get out. You’ll want it out as quickly as possible, but take your time so it’ll stay calmer. Close doors to confine the squirrel to one room and open several windows (screens removed, of course). Darken the room as much as possible, as it’ll be attracted to the light outside. Leave it alone and keep the household quiet. It may take 30 minutes just for it to come out of hiding; it doesn’t want to be there, but it’s frightened. If it’s nighttime when you discover the squirrel, you don’t have much choice but to leave it closed up overnight. It won’t venture forth at night. At daybreak, no later, be there to throw open the windows and then leave the room for a couple of hours. If you sprinkle some flour on the windowsill you’ll be able to tell if the squirrel has left. Or, bait a live trap with nuts, peanut butter or sunflower seeds. Or, try holding a blanket up in front of you so it does not see a human form. Drop the blanket on the squirrel and gently roll it up in it. Outside, just unfurl the blanket and it’ll take off like lightning. Wear leather gloves. Bat: Pause and take a deep breath. Then enjoy the experience of seeing a bat up close and personal, something few of us will have the pleasure of doing. They aren’t aggressive; even rabid bats don’t attack. But they’ll bite if you try to touch them. The likelihood of this bat being rabid is just about zero, but if you touch it bare-handed, you’ve condemned him to death, because for your own safety you should then turn it over to animal control to be checked for rabies. Animal control will, of course, euthanize it. Better to be safe than sorry, for both you and the bat. Close doors to keep him confined to one room. Open all the windows (remove screens). It might zoom all about the room looking for an exit. Don’t panic! Bats have good eyesight and it won’t touch you. Your every instinct will be to wave your arms and try to bat (pun intended) it away, but resist the urge; it’s frightened. If it’s on a wall, slowly place a jar over it and a stiff piece of paper under it to trap it in the jar. To release it, lay the jar on its side, it’ll walk out and fly away. Raccoon: Close doors to other rooms to keep it confined to one room. Open windows (remove screens) and leave it alone to find its way out. Don’t be surprised if it doesn’t leave until after dark. You might be able to help it find an exit by placing a strong-smelling, enticing food just outside one of the windows. Or, bait a live trap with fish-flavored cat food, sardines, ripe bananas, jelly, peanut butter or marshmallows. 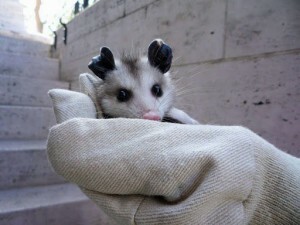 Opossum: Same as for raccoon eviction. Use for bait: sardines, old meat, bacon, fish, apples or canned dog food. Release the rodents into tall grasses at least one mile from your house or they’ll find their way back (no kidding) and second time around they’ll be wary of your trap and harder to catch. Release them early in the morning so they’ll have a chance to get the lay of the land and build a nest before nightfall. The grasses will help shield them from birds of prey. An alternative, humane method is to put peanuts in the bottom on a deep bucket. Set the bucket on the mouse trail and position a couple of boxes as steps to the top of the bucket. Once in the bucket, the mice can’t get out. Snake: First, stay calm. The snake is as unhappy as you are. Snakes don’t like confrontation and simply want to escape. This is true even with venomous ones. Call a professional animal trapper if you need help, especially if you think the snake is venomous. Don’t kill the snake. It’s an important member of your backyard wildlife habitat. Not only that, but in some states it’s against the law. Release it close to some protective cover at the back of your yard. Don’t forget to look for the hole it used to enter your house and seal it up. Don’t lose sight of the snake or you may never find him again. Snakes can find hundreds of places around your house to hide in, on, behind or under. They’re fast, so you’ll need help. Use brooms to guide him into a box or trash can. Snakes are escape artists, so take care to secure the lid while carrying it back outside. You can also try to grab the snake by his tail and drag it outside. Or hold it by the tail and lift the front of its body with a stick and carry it out. Another technique is to throw a towel or blanket over the snake and quickly scoop the whole bundle into a container. Or, use a long stick with a Y-shaped end to pin the snake to the floor while sweeping it into a large bucket. Another idea is to place damp, rumpled clothes where the snake has been seen. Cover them with dry cloths. This is the kind of hiding place a snake prefers. Once it enters the pile, gather everything up and carry it outside. And, finally, you can use a glueboard. They’re available at local hardware stores. Once caught, take the snake outdoors and soak the glue strip with vegetable oil to release it. In about an hour it’ll be able to free itself and slither away. Don’t forget to seal its entry hole into your house. Don’t try to smoke animals out of your chimney, as they can die easily from smoke inhalation. This also leaves you with the unpleasant job of trying to retrieve dead bodies. If they’re inaccessible, you’ll soon have an odor-control problem and the expense of hiring professional help. If the animal is making a lot of constant noise, it’s trapped and trying to get out. Most likely it’s a squirrel or bird. If you hear periodic sounds but otherwise the animal is quiet, it may be a raccoon using the chimney as a den site, perhaps even raising her young. See above, about raccoons in an attic, for tips about this. A chimney cap will prevent animals from getting in your chimney. Bird: If it’s a bird that’s nesting, she’s probably not trapped, she’s raising her babies. So, wait for them to fledge. After that, the parents will also abandon the nest. Clear out the nesting materials and install a chimney cap or wire cover to prevent future habitation. If it isn’t nesting season and the bird is trapped, do this: Close all the doors to the room, open windows (screens off), turn off lights and open the fireplace damper. Sometimes a bird finds its own way down the chimney into the room, but if it doesn’t, force it down with a broom handle, long cord or even a garden hose. Once in the room, it should be drawn to the bright, open window and fly out. If it doesn’t find its way out, try to trap it in a corner and grab it with your hands. Or, if you have a butterfly net, so much the better. Be gentle, birds are fragile. Squirrel: Lower a knotted rope down the chimney for it to climb and then leave until you believe it’s gone. If the rope trick doesn’t work, darken the room, close the doors to it, open the windows and then open the damper. You might want to try channeling the squirrel directly to a window, like cattle through a chute, by arranging furniture to create a path for it to follow to the nearest open window. Also, you can place a box below the window. With luck, the squirrel will drop from the chimney, run along the “chute,” jump onto the box and then out the window. To prevent ashes and soot from getting on the floor place a drop cloth or towels. Leave the room. If possible, go outdoors and, from a distance, watch the windows. It may take quite a while for the squirrel to come out of the chimney; it’s frightened. If it detects your presence it may scurry right back up above the damper, or worse, behind a piece of furniture. You definitely don’t want the squirrel staying in your room longer than necessary, it’ll start trying to chew its way out. First, consider whether this is causing a problem. If it isn’t, let the animal stay. If you can’t, then shine a bright light (like a mechanic’s light) under the porch and place a portable radio there, too, tuned loudly to a hard-rock station. Next, saturate rags in ammonia and place them near the entrance (you’ll need to re-wet the rags a couple of times a day.) Keep this up constantly day and night until the fourth day. On the fourth day, sprinkle a heavy layer of flour outside the entrance. On the fifth morning check for footprints. If there are none, wait one more day just to make sure nothing is coming or going and then seal up the entry hole. Don’t let foxes live under your house under any circumstances. If they find an entrance (an adult fox can squeeze through an opening just six inches square), they may decide to use the nice, warm, dry environment for a natal den. Although this may sound fun, the following will persuade you otherwise: The kits will play at night, raising an insomnia-inducing, very loud racket of screams and calls. Kicked up dust will penetrate every nook and cranny of your house. They will chew on stuff — water pipes, telephone cables, electrical lines. Until they’re old enough to start leaving the den, they’ll defecate and urinate there, giving rise to extremely foul odors wafting up through your floorboards. And, decomposing prey may be left lying under there until the fox family gets hungry for it. Your harassing presence should be enough to convince the parents to move their pups. Bright lights and hanging around the den entrance will probably be enough to drive them away. Be careful not to corner one, though, they’ll fight to protect themselves and their family.